The Dal waters may not be crystal clear -- a boatride along the lanes and bylanes of fetid water may make you want to take the shortcut to the mainland -- but if you are in the middle of lotus plantations, you will instantly forget this ugly side. Acres of lotuses in full bloom are unique to the Dal wetlands, not just because they present a perfect picture but because of their importance to the lake residents. Once a year, the lotus is harvested for its stems (called nadru) which are eaten all year round. "Foreigners love to come to these plantations on moonlit nights and spend long hours here," says Nazir Kana. Another thing that strikes the visitor during a ride across the Dal lanes is the floating gardens, known as raad in the local dialect. The whole aspect of vegetable cultivation is of great importance to the lake dwellers. Nobody knows how this indigenous method of cultivation originated. All they can say is that the system has existed for generations. Nazir Hussain outlines the details of the laborious process which finally ends in the formation of a floating garden. Once the site for a raad is identified, a weed called piyach (local name) is introduced into the area. The local people make sure that the raad is not more than 6 feet in width. There are, however, no constraints on its length. In 2-3 years, the stems of the weeds reach the lake bed, which is around five to six feet deep, and penetrate a further two to three feet into the lake bed. Then the operation to raise the floating garden begins. A raad liven, that looks like a gigantic pincer consisting of two planks -- each three feet in width -- is lowered by two people in two boats into the soft sediment of the lake bed. A two feet thick slab of soil, held together by the weeds, is manually severed from the bottom of the lake with the help of the planks which are fitted with steel edges. The planks then float to the surface bearing a portion of the lake bed with them. More soil is added to the surface of the raad. The weed decomposes to become a natural fertiliser for the vegetables to be grown. 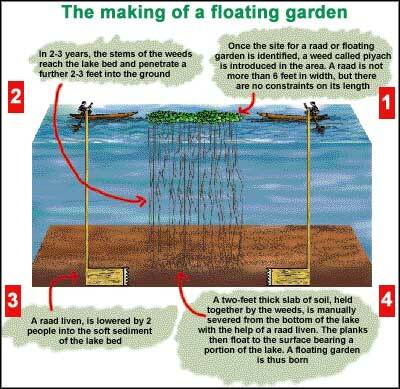 A floating garden is thus born (see diagram: The making of a floating garden). Though lake residents have been practicing this ingenious form of cultivation for centuries, it has become a regular feature only since the militancy problem peaked in the valley. Most of the residents, who depend on tourism, have been forced to take up agriculture to meet their daily needs, says Mohammed Iqbal, who sells zafran (saffron) in his spare time to supplement earnings for his five-member family. And, today, cultivation on the lake -- vegetables or lotus farming -- is their only source of income. Even if given a choice of a home and job on the mainland, many of them will turn the offer down. Says Nazir Hussain, "Instead of rehabilitating us, the government should make conditions on the lake better... may be construct roads and keep canals clean." While the government has labelled the floating gardens and land on the lake as "encroachments", it is difficult to guess the reasoning behind why lake residents have been provided with electricity, water and some with phone connections. "If the government prohibits cultivation on the lake, I will be forced to steal for a living," says Moiuddin Aslam, a resident of Sheikh Mohalla and father of six children.